President Trump’s frequent advocating for a better national relationship with Russia—via his Twitter account, among other channels—has provided the need for scrutiny. Thus, it is worth taking a deeper dive into one industry that could prove a sticking point: energy, which greatly affects Russia’s economy. Part of the design of the economic sanctions imposed after the Russian annexation of Crimea was to weaken the country’s energy export market. However, the layer of unpredictability that Mr. Trump presents to policymaking, even after the intelligence briefing on Russia’s involvement in the election, leaves analysts alarmed. Trump’s policies are currently more speculation than anything. His cabinet nominees during the Senate confirmation hearings have broken away from his campaign promises, and he has not yet ruled out reversing economic sanctions on Russia. Trump’s strange admiration of U.S.’ established foe, Russian President Putin, has many foreign policy experts—as well as Republican Congress members—scratching their heads. Observed through the prism of geopolitics, the energy industry leads to rather interesting partnerships and conflicts. There is no doubt that the global nature of energy markets makes it necessary for leaders to be diplomatic with other nations. 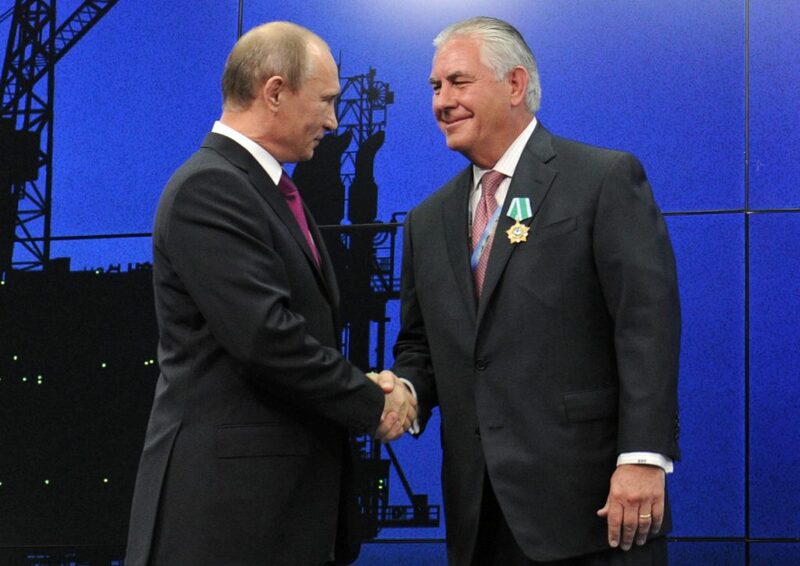 It is widely known that Rex Tillerson, the CEO of ExxonMobil and nominee for secretary of state, has deep ties in Russia (He was awarded Russia’s Order of Friendship in 2013). This begs the question if conflicts of interest will remain even after he sells his stakes in the company. Tillerson’s relationship in Russia stretches decades. His first successful deal in Russia was negotiated with Putin for the $17 billion Sakhalin-1 project in 1997, during the Yeltsin regime, which consists of three oil and gas field on sub-Arctic Sakhalin Island. It is operated by Exxon Neftegas Limited, a subsidiary of ExxonMobil and produces about 200,000 barrels of oil per day. Tillerson has also previously expressed his skepticism with regard to the sanctions imposed on Russia. Indeed, the sanctions just so happened to stall a massive investment framework that Tillerson had negotiated. The Wall Street Journal reported in 2011 that Tillerson worked on a $500 billion Arctic oil contract between ExxonMobil, the Kremlin, and the Russian state-owned Rosneft oil company. At Exxon’s 2014 annual meeting, Mr. Tillerson said: “We do not support sanctions, generally, because we don’t find them to be effective unless they are very well implemented comprehensibly, and that’s a very hard thing to do.” That statement was made before the Obama administration leveled new sanctions against nine Russian entities, restricted access to two properties in the U.S. and removed Russian individuals. How will the new secretary of state and President handle U.S.-Russia relations going forward? Despite Mr. Trump’s current efforts to rekindle a collegial relationship with Russia, natural gas could lead to conflicts during the potential reconciliation efforts. Natural gas exports provide a major stream of revenues for Russia’s economy and any further jolt will affect its already struggling finances. Today, about 30% of the world’s consumed gas is traded internationally. Russia is a dominant supplier of natural gas to Europe, which is something many European nations have been working to move away from (it is important, however, to note that Germany has moved forward with the Nord-Stream 2 pipeline). Russia’s proven natural gas reserves, according to the U.S. Energy Information Administration (EIA) data, are the largest in the world with nearly 1,688 trillion cubic feet (tcf)—compared to Iran’s 1,201 tcf and Qatar’s 866 tcf. However, as experienced in 2006 and 2009 in Eastern Europe, Russia can limit the amount it exports despite contracts, during times of turmoil and turn off the figurative spigot. This background threat further stimulated the desire for those nations to search for alternative sources in order to reduce their reliance on Russian gas. The LNG market could provide a solution. Indeed, it eliminates the need for sprawling pipeline networks and reduces energy reliance on Russia. LNG is natural gas that undergoes a liquefaction process at specially constructed plants, is loaded on special tankers and shipped to regasification terminals where the new energy feedstock can be distributed to consumers. The global market for LNG increased about 7% per year between 2000-2012, according to Ernst and Young. LNG export capacity is forecast to increase by 45% between 2015 and 2021, 90% of which would originate from the U.S. and Australia, according to the International Energy Agency (IEA). The American LNG industry is in its infancy stages but, as noted by the IEA forecast, is predicted to grow and increase market competition. Advocates believe Trump will expedite the current permitting and approval process where about 30 applications are pending (there is 1 operating export terminal in Louisiana—Sabine Pass—and others in the Gulf Coast and Maryland under construction). The EIA states that by 2020, the U.S. is set to become the world’s third-largest LNG producer, after Australia and Qatar. This is where the rub with Russia could start, granted it would take years to develop a large industry. Indeed, the U.S. increased natural gas supply on the international market would cut into Russia’s market share. In the past, it was thought that increasing consumption of natural gas in Europe would mean greater reliance on Russia. However, LNG loosens those constraints. And having the U.S. as a reliable trading partner could cement that expansion, as the new natural gas could also serve as a baseload power supply with the large amount of renewables being integrated across Europe to counter the currently accompanying intermittency. Thus far, the U.S. has exported to Spain and Portugal with companies capable of establishing floating LNG terminals in other European markets, as regasification terminals are costly and are long-term construction projects. Russia does have LNG plans of its own, but its gas export business will continue to be pipeline dominant, limiting its flexibility. Today there are over 30 global markets for LNG, and possibly doubling by 2030. There is one large LNG project operating in Sakhalin, led by Gazprom, and construction is underway for a massive LNG facility, Yamal, potentially with a price tag of $27 billion, helped with funding from the Chinese. Even then, Russia still may need to discount their gas price to meet rising competition. To be transported, as noted, LNG needs a specially designed ship. Thus, as demand has grown, LNG has added a new dimension to the maritime industry. Maritime shipping is vital for trade and the global economy. More than 50,000 ships are in operation around the world, trading across waterways and carrying 90% of all goods, commodities, and products, according to the International Maritime Organization. The new vessels enable LNG to be transported across large swaths of ocean to buyers. Of course, being able to transform the gas to a liquid eliminates the constraint of needing a pipeline for transit to specific points. With LNG being shipped out from the Sabine Pass facility in Louisiana, the new expansion of the Panama Canal, completed in 2016 after many delays, can facilitate those vessels and offer competitive prices enabling efficient transit to Asian markets. Indeed the old Panama Canal locks were too small for these vessels. The route provides the ability for a shipment from the Gulf Coast to Japan to be reduced from the current 34 days to 20. In fact, the Panama Canal Authority instituted separate tolls for LNG vessels in order to promote route attractiveness. Avoiding any need for canals, Europe, and potentially the west coast of Africa in the future, is a natural fit for LNG shipments leaving the Gulf Coast and Maryland. All and all, with the increased natural gas demand and new sources of production, U.S. industry could cut into Russia’s economic lifeline, potentially impeding bridging the sought after closer national ties.